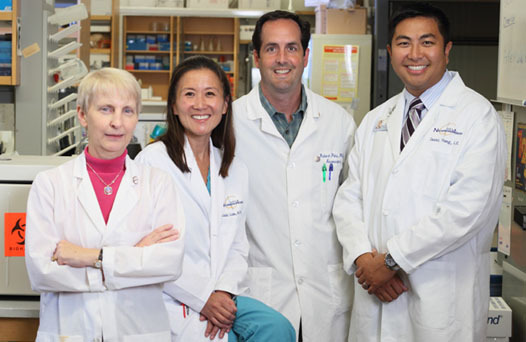 The UCLA Acoustic Neuroma Program at the Ronald Reagan UCLA Medical Center is a multi-disciplinary team of experts in their respective fields collaborating to provide exceptional care for patients with acoustic neuroma. We provide comprehensive evaluation, diagnostic testing, and a wide range of treatment options. Our skull base surgeons are specialized in the management of acoustic neuroma and utilize the most advanced treatment technologies to provide the safest and most effective care. Insight gained through research has advanced our understanding of the biological mechanisms underlying acoustic neuroma development, growth, and recurrence. We strive to continually refine our treatment of acoustic neuroma through incorporating the newest scientific findings and technologies into our practice. Our mission is to provide comprehensive and personalized state-of-the-art care for patients with acoustic neuroma. Currently at UCLA both Neurosurgery and Otolaryngology Head and Neck Surgery Laboratories are banking the tumor tissue from acoustic neuromas to investigate them on a molecular and cellular level. We hope that these basic science investigations and tumor banks will lead to novel insights and develop novel research that translates into more effective and safer treatment of acoustic neuromas. Acoustic neuroma, also known as neurinoma or vestibular schwannoma, is a benign (non-cancerous) fibrous tissue growth arising from the vestibulocochlear nerve. Located in the inner ear, the vestibulocochlear nerve (eighth cranial nerve) controls hearing and balance. Acoustic neuromas slowly grow over many years but do not metastasize to other areas. However, these tumors are located deep within the skull near centers of the brain that control vital functions. Pressure resulting from tumor growth can press against these sensitive structures, severely affect neurological function, and become life-threatening. Symptoms can range from mild to severe and can include loss of hearing in one ear, ringing of the ear (tinnitus), loss of balance, and dizziness. However, these symptoms are not always suggestive of acoustic neuroma, and a thorough evaluation by your physician is necessary to reach a proper diagnosis. Acoustic tumors comprise roughly 6% to 10% of all primary brain tumors with an annual incidence of one out of every 100,000 people, with 2,500-3,000 new diagnosed cases in the United States every year. While these tumors can occur sporadically, patients with the genetic condition Neurofibromatosis 2 (NF2) often develop acoustic neuromas in both ears. 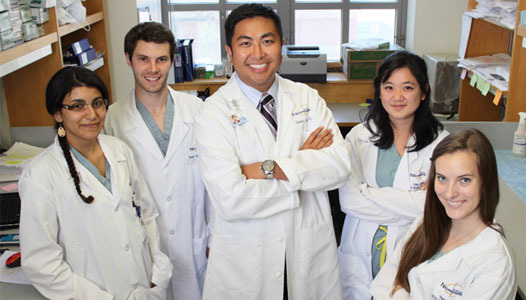 At the UCLA Acoustic Neuroma Program, a multidisciplinary team approach is utilized to provide the best care for our patients. Treatment depends on a number of factors including patient age, overall health, tumor location and size, and the rate of tumor growth. A team including neurosurgeons, otolaryngologist, radiation oncologists, neuroradiologists and other health care professionals meet to evaluate each unique medical situation to create a treatment strategy that is the safest and most effective for each individual patient. Since some acoustic neuromas are typically incidentally diagnosed, they can be small, asymptomatic, and slow growing. Treatment can be held off and the patient can be followed through regular intervals of MRI scans and audiograms. If active treatment is recommended, acoustic neuromas are best treated by removal of the tumor through surgery or slowing tumor progression through radiation therapy. The goal of surgery for acoustic neuroma is to remove as much of the tumor as possible while preserving hearing, balance, and other cognitive functions. A variety of surgical methods are available including the retrosigmoid, translabyrinthine, and middle fossa approach. In the translabyrinthine approach, the surgeon enters making a "C" shaped incision behind the ear and enters through the mastoid and semicircular canals to reveal the most lateral aspect of the tumor. The semicircular canal is a set of fluid filled chambers involved in controlling balance. With direct access to the tumor, the surgeon can then remove the tumor without retracting healthy brain. This procedure sacrifices hearing so this approach is reserved for patients with no useful hearing in the affected ear. However, this approach minimizes damage to the facial nerve and surgical removal is not limited by tumor size. In the retro-sigmoid approach, also known as keyhole craniotomy, the surgeon makes a small incision behind the ear, which provides the neurosurgeon access to the cerebellum and brainstem. This minimally invasive surgical approach is effective in preserving hearing, removing tumors of all sizes, and decreasing spinal fluid leak. However, it is more difficult to completely remove tumors that extend too laterally, and there is an increased risk of post-operative facial weakness. In the middle fossa approach, an incision is made in front of the ear. Bone covering the top of the internal auditory canal is removed to expose the tumor. This approach produces the best outcomes for tumors less than two centimeters in diameter. While this approach provides the best chance for hearing preservation, it is limited to smaller acoustic neuromas. Complete removal is often achieved with this procedure. Surgeries for acoustic neuromas are associated with inherent risks including hearing loss, impaired balance, and damage to the facial nerves. Radiation therapy is an alternative treatment option. Radiation therapy utilizes highly focused beams of radiation to destroy tumor cells while aiming to minimize damage to adjacent, healthy brain tissue. While this approach does not remove the tumor, radiation can limit tumor size and tumor growth. LINAC Radiosurgery utilizes high energy x-rays resulting from the impact of accelerated electrons and a heavy metal target. Advanced imaging technology helps conform the x-rays into the shape of the tumor. The LINAC machine is able to rotate about the patient's head to allow for targeting from any angle. This method does not require the use of a stereotactic frame and allows for fractionated treatments with lower doses. In fractionated stereotactic radiotherapy, radiation is delivered over several sessions with lower doses than in radiosurgery. This limits the side effects of higher doses to surrounding nerves. Systematic Analysis of Hearing and Facial nerve Preservation in Vestibular Schwannoma treated with Gamma Knife Radiosurgery (2009 Leksell Radiosurgery Award). Video (MP4) 13:02. 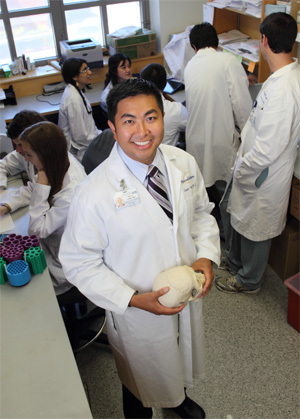 Isaac Yang, MD. William A. Friedman, MD, FACS (discussant).